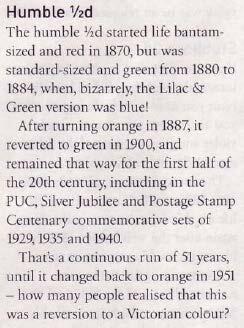 Based on David Wright's The colours that kept on running from the September 2009 issue of Stamp Magazine. Here are the entries from the article. 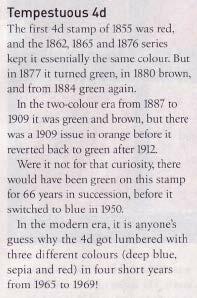 In concentrating on colour, it misses some issues. 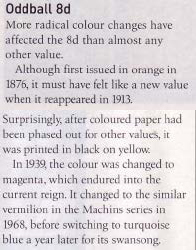 1911 SG267-271 A new printer, similar colours and wider price ranges. 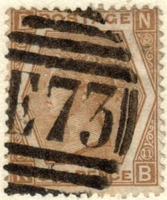 SG279 and 279a, expensive perforation variants. 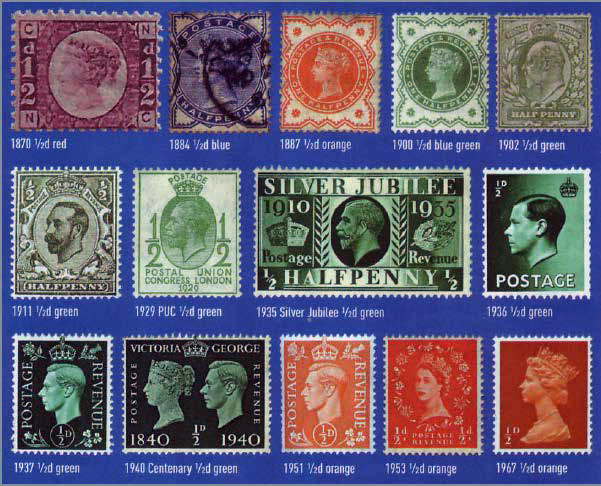 1911 SG321-326, all varieties of green with SG322 the cheapest at £8/4. 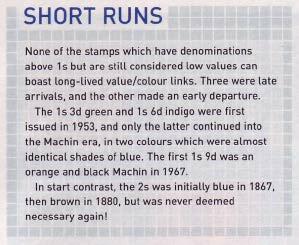 [£8/4/2] SG334-335 are from booklets and expensive. 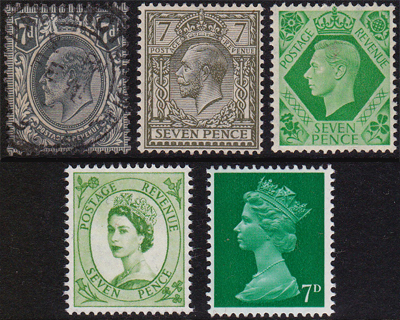 1940 SG479 green centenary [£4 m/u for the set]. 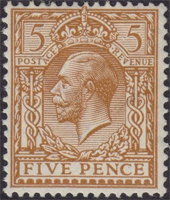 ✓ 1953 SG515 orange-red 15p m/u [10p]. 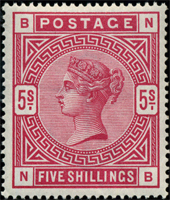 1955 SG540 from booklets. 1957 SG561 graphite for sorting. 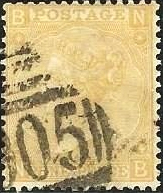 1958 SG570, watermark, both similar prices. 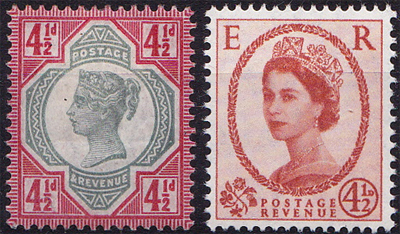 1958 SG587 expensive paper variants. 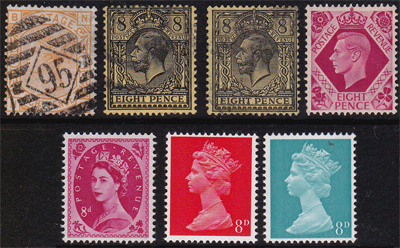 1959 (SG599) and 1960 (SG610) phosphor bands. Others: SG164/5 U; SG187 U; SG213 M; SG215-7 M; SG322 M; SG339-40 MU; SG457 M; SG485 M; SG503 M; SG515 M.
[27Feb12] #1 Appropriately the first acquisition is the first stamp, a bantam ½d for £12.49. 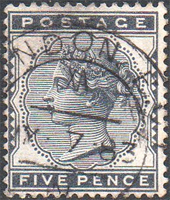 Inevitably I then found one with my initials #2 selling for £17.99: not as good a stamp, but I would have preferred it. So it goes. 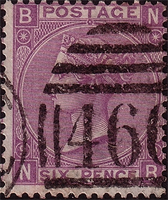 [25Mar12] #3 SG287 from a Bexley PS box for £1. [7Apr12] #4 bantam NB on ebay, starting at a sensible £1.99 which I failed to win. [29Apr12] #5 I didn't expect to buy this BiN, but I did, for £11.99. And was immediately glad that I had. 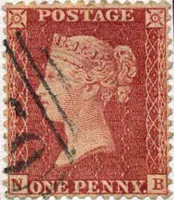 Much of the detail has already been taken care of on the Penny Stamps page. 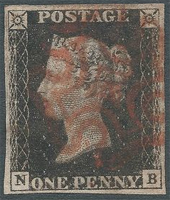 ✓✓ 1840 SG1 (intense black) £8,500/375 m/u and SG2 (just 'black') £6,500/275 m/u. [£12k/275/90, mint/4-margin/3-margin]. 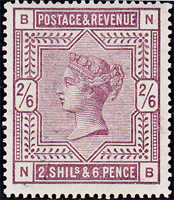 ✓ 1881 SG174 mauve £3/2 [£1/1]. No more letters. 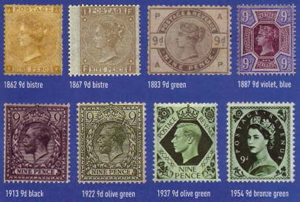 ✓ SG171 (£125/25 [£150/15]) has 14 rather than 16 dots in each corner - I'll do without one of those for now. 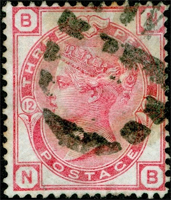 ✓ 1912 SG341 bright scarlet £5/2 the only difference is the shading on the lion. 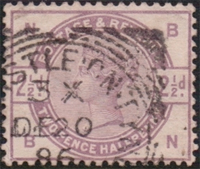 ✓1924-5 SG430/432 British Empire Ex - too large. 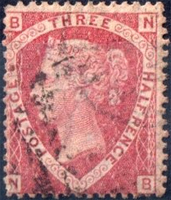 ✓ 1929 SG435 scarlet £3/2 commemorating PUC, but included as it is the right size. 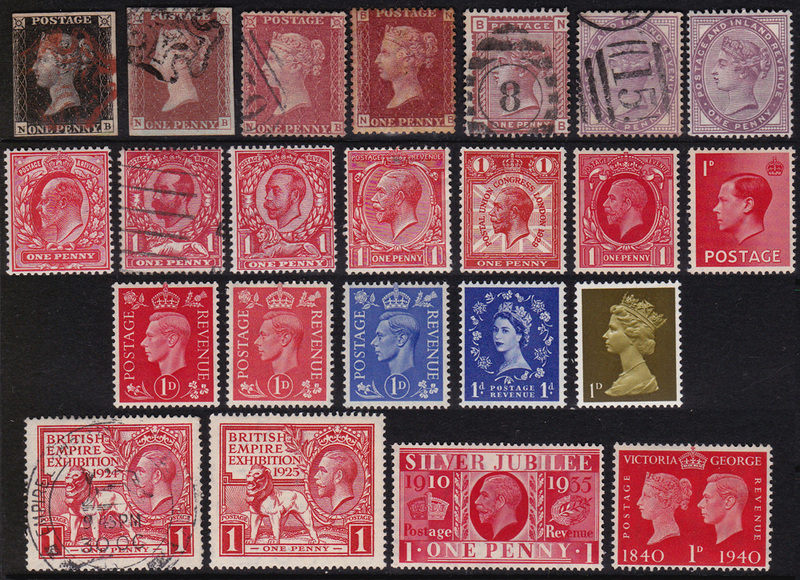 ✓1940 SG480 scarlet £1/1 centenary, too wide. 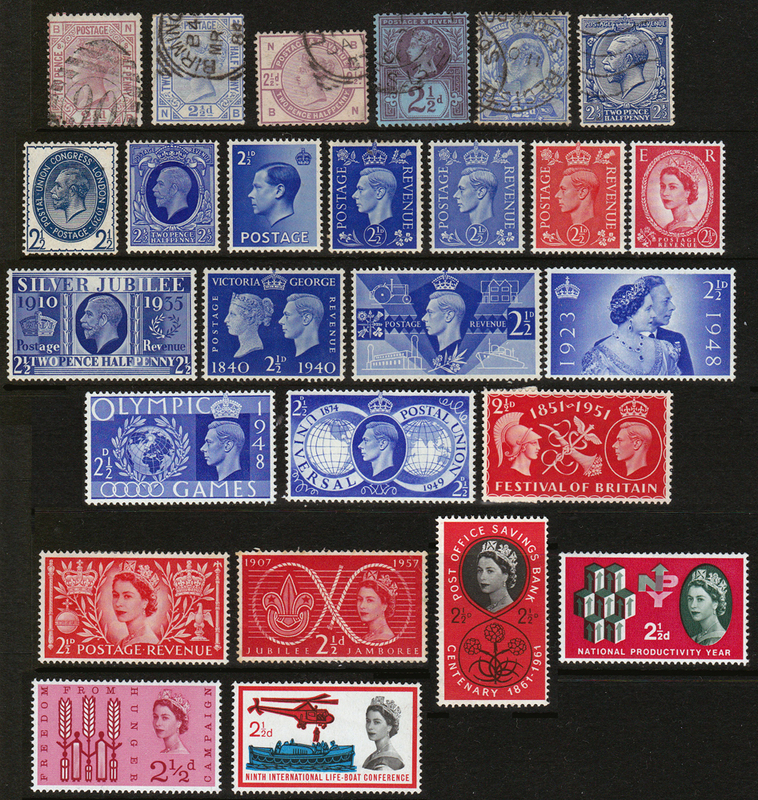 ✓ 1952 SG516 blue < £ numerous wmk, graphite and phosphor variants. Already in stock - SG2, SG8, SG43, SG174, SG341, SG357, SG435, SG440, SG458, SG463, SG724. 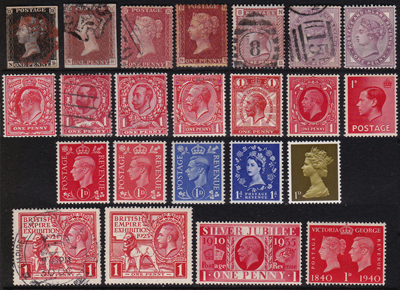 Stocked but initials needed - SG17, SG166. 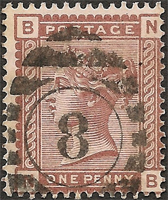 Needed: [SG171 M/U] SG219 M; SG327 M; SG486 M; SG504 M, SG516 M.
[6Mar12] #2 SG166 on ebay, starting at 79p, finishing in four days. Has to be worth a punt at that price. [11Mar12] Got it for 79p. 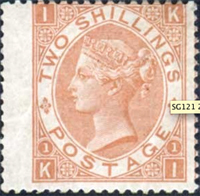 [4Apr12] #3 SG43, a nice red starting at 99p. 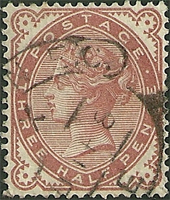 Not a perfect stamp, but a lovely colour, bought it for £5.50. 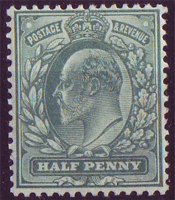 [5Apr12] #4 Penny Black with four good margins selling for £195 and #5 a nice pair for £350. [18Jun12] Complete - I'll post a scan when they all arive. 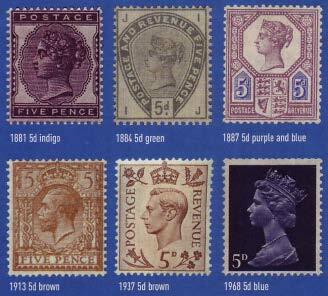 ✓ 1912 SG362-365 various browns, SG362 is £6/4. 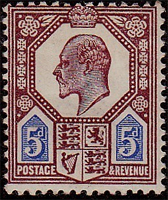 Then 1924 same design £2/1. 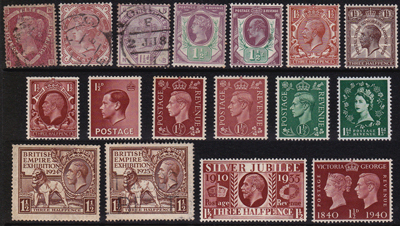 ✓1924-5 SG431/433 British Empire Ex - too large. 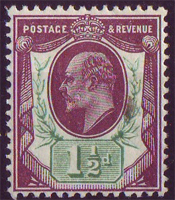 ✓ 1929 SG436 purple-brown PUC £3/2. 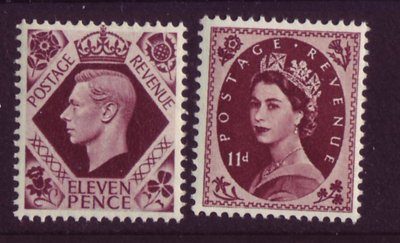 ✓ 1934 SG441 red-brown £1, both. 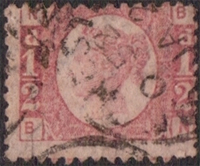 ✓1940 SG481 red-brown, stamp centenary, too large. 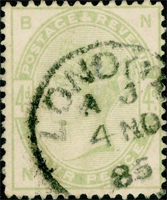 ✓1951 SG505 pale green UPU < £. Needed: SG51-52 U NB; SG167 U NB; SG188 U NB; SG287-289 U; SG459 M; SG464 M; SG487 M; SG505 M; SG517 M.
[6Mar12] #1, a nice SG51 on ebay, but overpriced at £100. I'll wait for another. 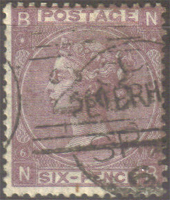 [24Mar12] #2, a nice SG188 on ebay, starting sensibly at £1.99. In with a chance. [29Mar] And bought with the only bid. 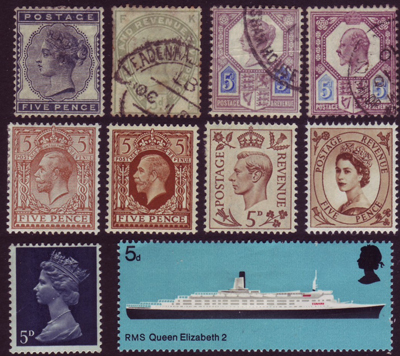 [25Mar12] #3 SG215 from a Bexley PS box for £2. 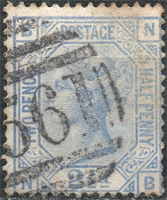 [14Apr12] #4, two SG51s on ebay, one an NB, starting at 99p. 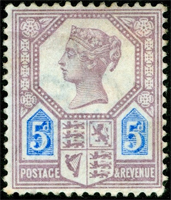 [8Jun12] #5 SG167 bought for £8.49. [18Jun12] Complete - I'll post a scan when they all arrive. 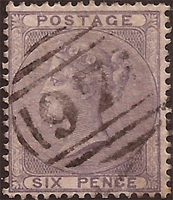 1910 SG266a the unissued Tyrian Plum £65,000. 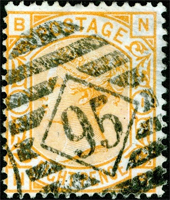 ✓ 1912 SG366-370, all orangey. 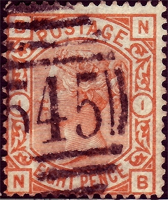 SG369/70 £8/5. 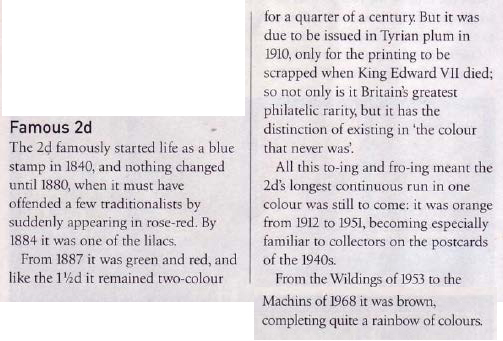 A new printer in 1924 for SG421 @ £4/3 will do. 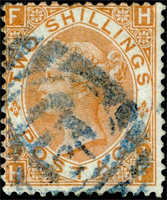 ✓ 1935 SG442 orange £2/1. 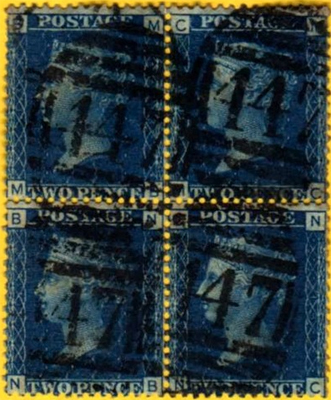 1968 Machins came in two types, distinguished by the spacing of the value from the side of the stamp. 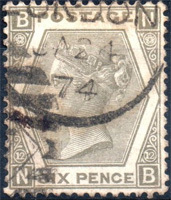 Both lake-brown and < £1 ✓ SG726 type 1 SG727 type II. 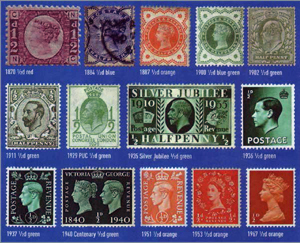 Needed: SG34/35 NB U; SG45 U; SG168/a U; SG189 U; SG200 M/U; SG290-92 M/U; SG266a fake; SG465 M; SG506M; SG518 M; SG727 M (type II). [18Mar12] #1 but I bought this one for £6.75. 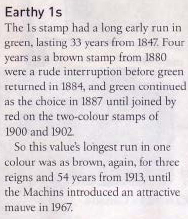 [16Apr12] #2 A block of four SG46s starting at 99p. [28Apr12] #3 An SG45, mine for £5.50. [29Apr12] #4 SG14, BiN, bought for £11.99. The pressure is on now to find an SG4 NB. 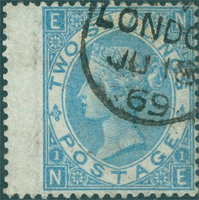 1912 SG371-3 blue(s), get SG371 £12/4. 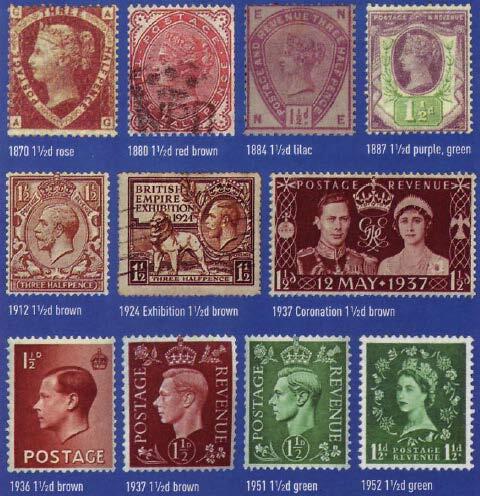 Also new printer 1924 SG422 £10/5. 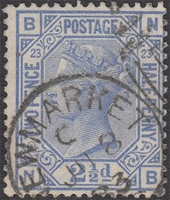 1929 SG437 blue PUC £10 both. 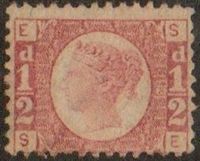 ✓ 1935 SG443 ultra £2/1. Already in stock - SG142 (need better), SG443, SG466. Needed: SG141 U; SG157 NB U; SG190 NB U; SG201; SG230/31; SG371 or SG422 M; SG437 M; SG460 M; SG483 M; SG489; SG507 M; SG519 M.
Coms: SG456 M; SG491 M; SG493 M; SG495 M; SG499 M; SG513 M; comms to 1963. [2Mar12] #2 SG157 currently on ebay, finishing tomorrow. Got it for £1.99. [6Mar12] #3 SG141 on ebay for £5.99, finishing in two days. Probably just about worth that. [8Mar] I bought it. 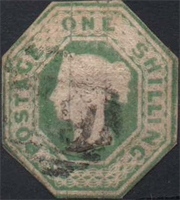 [27Mar12] #4 SG190 starting on ebay at 75p. Got it for 75p. 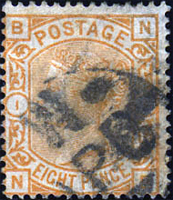 1902 SG232-4 purplish on yellowish, best value SG232b, 233b and 234 @ £80/40 [£70/30/7]. 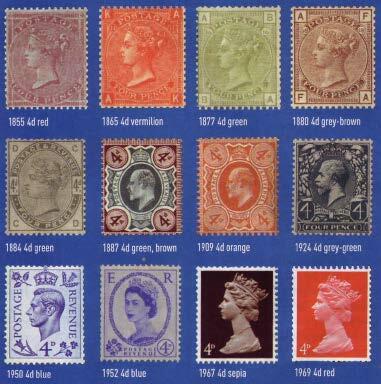 With a new printer, a similar SG277 and 285 and the 277a variant in grey on lemon @ £5,500/3,000. 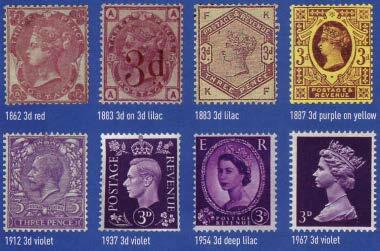 ✓ 1912 SG374-377 various violets, best SG375 @ £10/5. 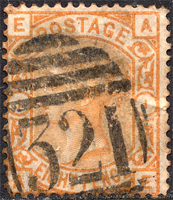 The 1924 SG423 with a new printer is more expensive. and #3 a lovely multiple SG103 selling for £100. 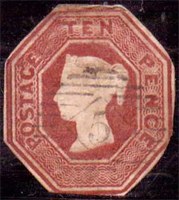 [7Apr12] #4 Not the nicest SG103, but priced to go, starting at 99p. If I get this then, with #1 and #3 aleady in the bag, I'll have my first set of small white, large white and large coloured corner letters. 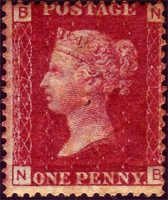 [14Apr12] Got it for £2.25: a fair price for an imperfect stamp. 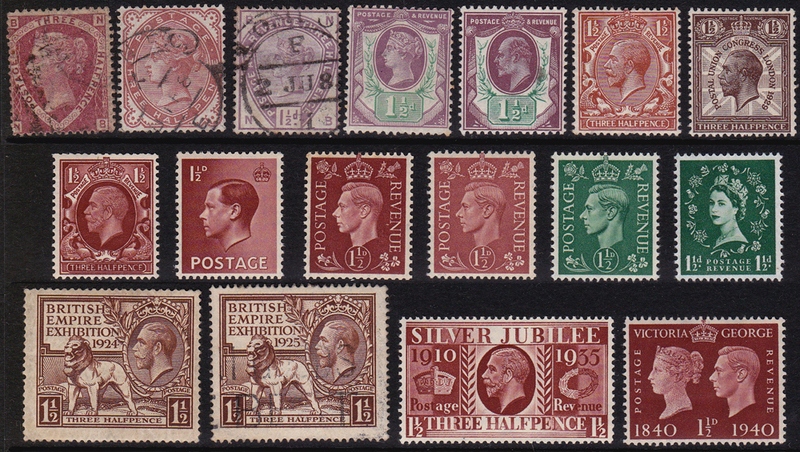 1909 SG239-241 various oranges, same design as 1902 SG240/41 both £45/20 [£32/15/10]. 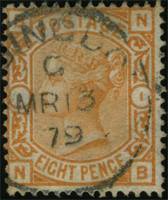 Also 1911 SG278 orange £75/50. 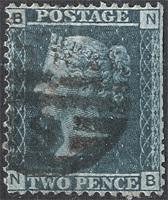 ✓ 1913 SG378-80 grey-green, get SG379 £15/2. Also SG424, new printer. 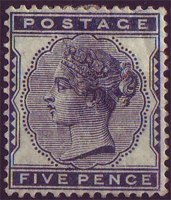 ✓ 1953 SG521 ultra £3/1. 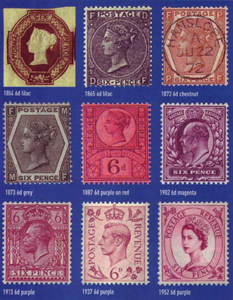 Also 1955 SG546 and 1958 SG576, cheaper. 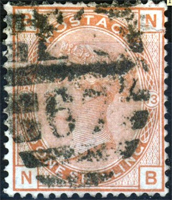 Needed: SG66 U; SG79-82 NB U; SG93-4 NB U; SG152 NB U; SG153 NB U; SG160 NB U; SG192 NB U; SG205/(a); SG235-238; SG240-41; SG445; SG508; SG576. 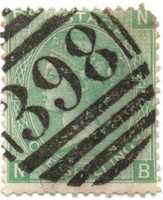 [13Mar12] #1 SG94 - not a pretty stamp, but it starts at 99p. Ending in five days. Mine for £3.45, 6% of catalogue. #2 Another SG94, rather nicer, selling at £6.99. 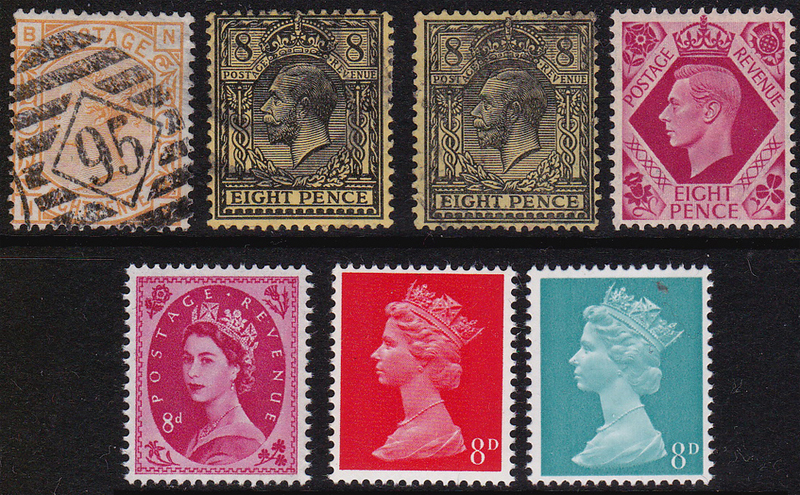 #3 SG160 - £11.99, rather over-priced and not quite pretty enough. 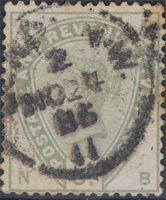 #4 SG192 - I can handle a heavy cancellation, but this is too messy to consider. Selling at £14.99. 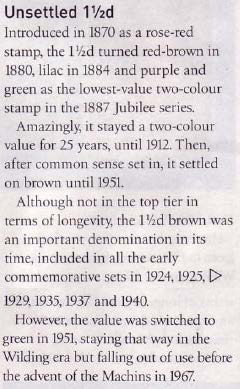 #5 SG192 - worth waiting for, bought 18th Nov 2012 for £5.16. 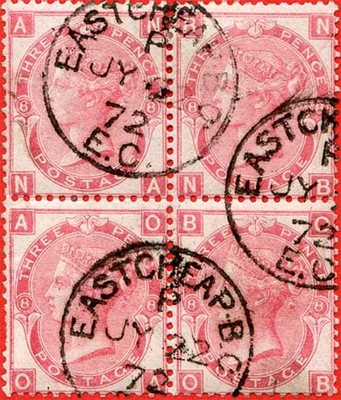 The E2 stamp was acquired on 5th March with a set of 1958 Wildings. 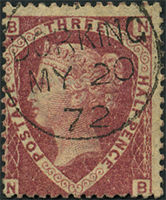 The first SG206 was with a used Victoria Jubilee set from ebay on 29th March, followed by a (heavily mounted) mint example from Orpington on 9th June for £2. The 5ds are quite well-behaved. 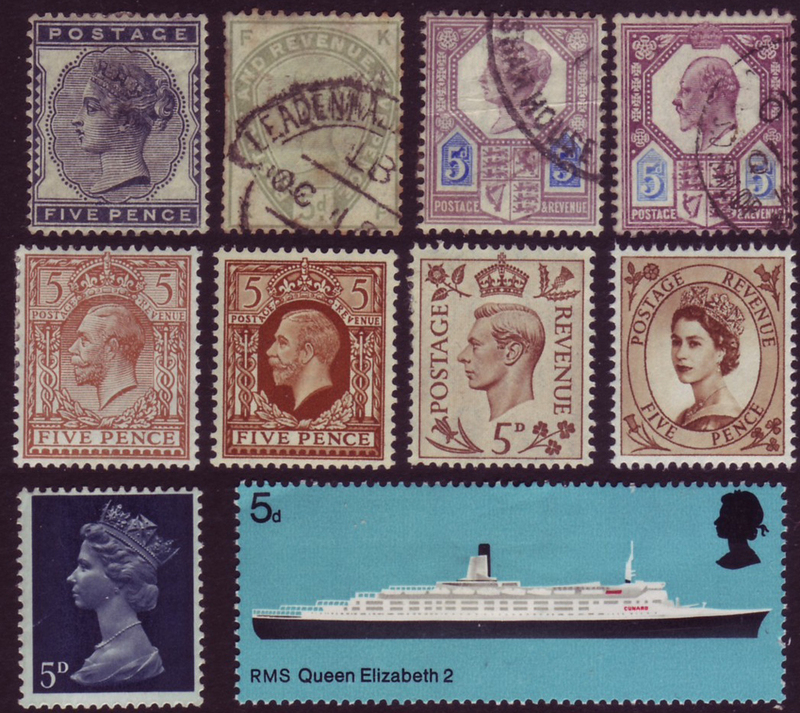 The first 5d commem is the 1969 SG778 QE2, the third panorama commem, after de Montfort and 1066. Needed: SG169 NB U; SG193 NB U; SG207a; SG293-4 M/U; SG381/2 M; SG446 M; SG469 M; SG578 M.
#2 A poor SG193, the only NB so far, selling for £17.50. 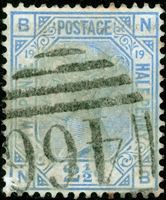 [16Apr12] Back again, this time for a nine-day auction starting at 99p. 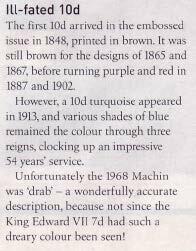 It's a shame about the foxing, but nevertheless, worth keeping an eye on. 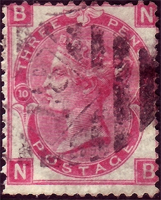 #3 SG207a, sold for £10.50. 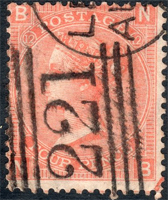 [25Mar12] #8 SG215 (with a thin) from a Bexley PS box for £12. Just SG193 with the right letters to go: I should have bought #2 above in April. 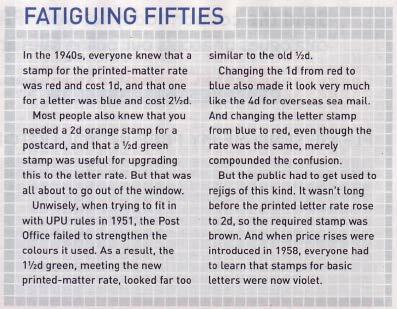 Unlike the 5ds, the 6ds are complex, with multiple colour changes and even punctuation changes and the lowest value of the three embossed issues. 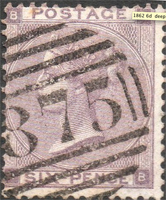 ✓ 1854 SG58-60 mauve/lilac/purple all £7,500/800 embossed. 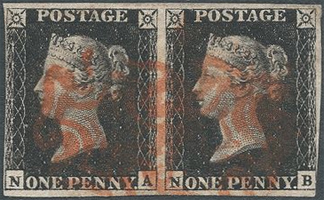 [£14k/525, 'examples cut to shape are worth considerably less'].
. Just SG194 to find with the right initials. Needed: SG58-60 U; SG69/70 U; SG83/4 NB U; SG96-7 or 104-7 NB U; SG108/9 NB U; SG122a NB U; SG125 NB U; SG146/7 or 161 NB U; SG162 NB U; SG194 NB U; SG208a M/U; SG245-8 or 295-301 M/U; SG426a M; SG470 M; SG523; SG579; SG736Ea; SG736Eb. Commem needed: SG497; SG501; SG568; SG621; SG629; SG636. [26Feb12] #1 I failed in my first attempted purchase on this project, a 6d NB on eBay which went for £6. 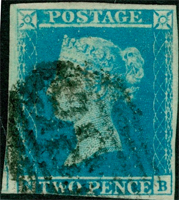 Not a great example with some foxing and damaged perfs, but a handsome NB and a disappointing start. [8Mar12] #2 On ebay at £7.99 (10% of cat) SG109. 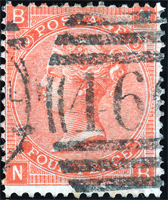 Poorly centred, the cancel is clean but rather extensive. I might. [18th] I did. 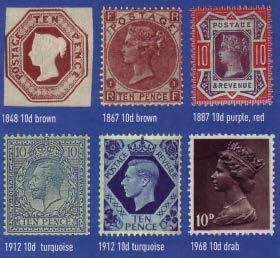 [24Mar12] #5 SG106 starting at £10.99 on ebay. Probably too much for a rather messy stamp. 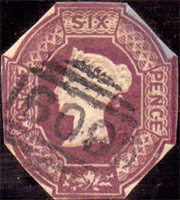 [26Mar12] #6 SG97 bought for £6.50 - a better stamp for 40% less. [16May12] #8 SG125 bought for £4.31. [17May12] #9 SG83 bought for £12.05. 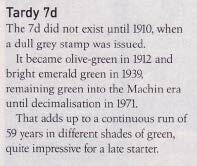 [19May12] #10 SG70 bought for £2.75. 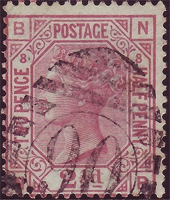 [8Jun12] #11 SG162 bought for £4.23. 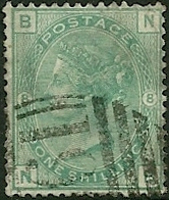 ✓ 1954 SG524 bright green £10/5. 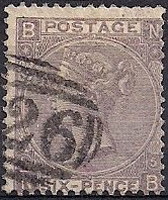 Printer 1956 SG549 brt grn £50/10. 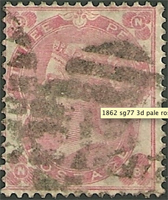 Perfs 1958 SG580 brt grn pence. And the usual graphos versions. 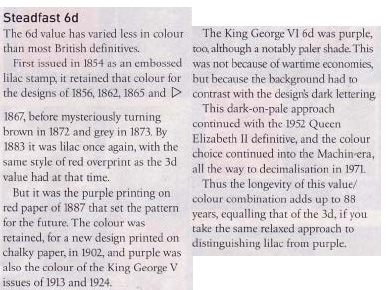 As with the 8d, the G5 colour variants are too subtle for me to appreciate or wish to acquire. 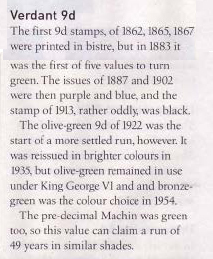 There are far more green examples than mine, and I will look out for one, but which is SG387, 8 or 9 is a matter of indifference. 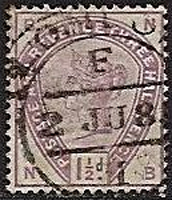 9d E2 stamp shown above in error. 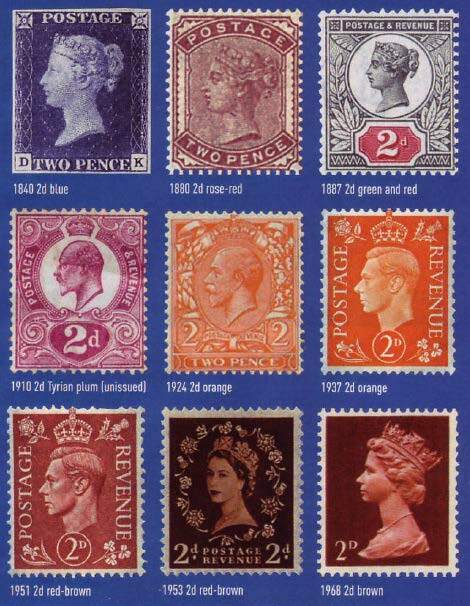 Needed: SG249 M; SG387 M; SG388 M/U; SG 389 M/U; SG471 M; SG580 M.
There is also an SG156a purple-brown, prepared but not issued, £7,500. 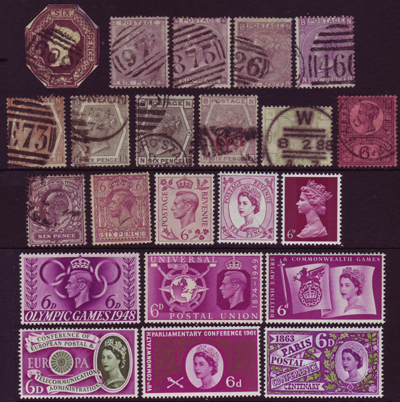 ✓ 1953 SG525 magenta < £1, printer 1955 SG550 £7/1 and the usuals. The distinction between SG390 black on yellow and SG391 black and yellow buff is too fine for me. 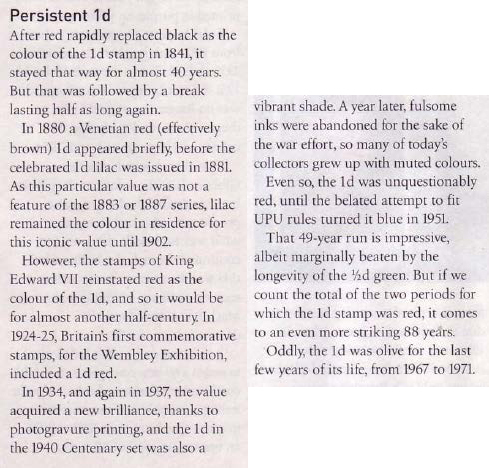 The 1d lion shading is a good example of the sort of differentiation which I regard as significant. 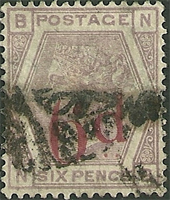 Needed: SG156 U; SG390 M/U; SG391 M/U; SG472 M; SG525 M.
[14Mar12] #1 SG156 £175 on ebay. There are much cheaper copies on sale, so I'm hoping that it's simply a matter of patience. 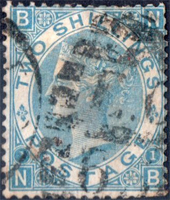 #2 In fact here's one for £20: a bit of a mess, but priced to go. [27Mar12] #3 SG156 starting at 99p. Not an NB, but worth considering as an interim solution. [30Mar] I paid £10.38 for it and I'm not sure why: I might as well have run to £20 for #2. 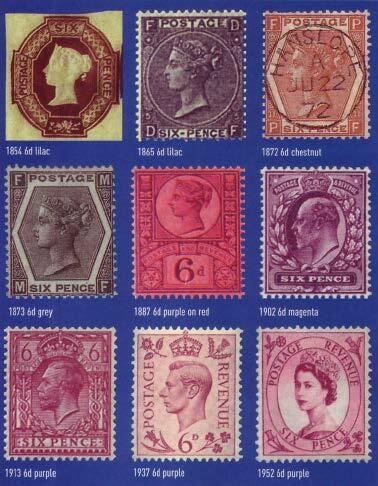 [4Apr12] I knew buying #3 was a mistake, but so would #2 have been as #4 popped up on ebay tonight for £22.99. That's the best SG156 NB I'm likely to see in a twelve-month, so I now have two. Now would be a good time to try and wrap up all the 8ds and bag the first full set. [7Apr12] #5 Here's another SG156 selling for £39.99. Better colour than mine, but I'm content. 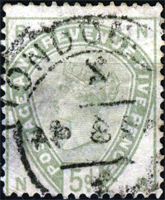 1913 SG392-4 agate and other greens: get 392 £15/6. 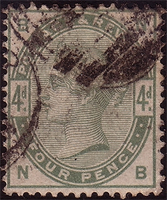 New printer 1924 SG427 olive green £12/4. ✓ 1954 SG526 bronze green £23/5: printer SG551 £20/3: perf SG582 pence. Needed: SG86/87 NB U; SG110/11 NB U; SG195 U; SG209 U; SG250/1 M/U; SG392 M; SG447 M; SG473 M; SG582 M.
1867 SG99 red brown, printed on the wrong paper £27k let's be realistic. 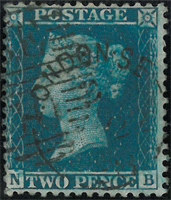 1913 SG394 turquoise £22/20: printer SG428 more expensive. 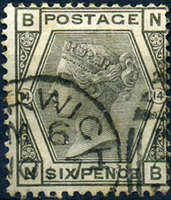 ✓ 1954 SG527 prussian blue £18/5: SG552 perf; SG583 perf: get 1966 SG617d printer pence. Needed: SG57 U; SG112 NB U; SG210 M (and maybe a 210B M/U); SG254/5 M/U; SG394 M; SG448 M; SG474; SG617d M.
[4Apr12] #1 SG57 two embossed found today, this one £13.27. 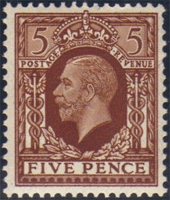 1954 SG528 brown-purple £35/15 - get the perf SG553 pence. 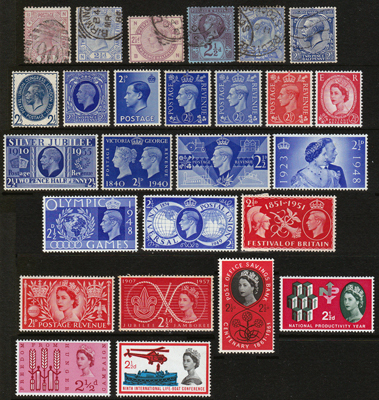 Needed: SG474a M; SG553 M.
Both bought at Beckenham Stamp Fair, 28th April 2012. Needed: SG54-56 U; SG 72/3 U; SG90 NB U; SG115-7 NB U; SG148-50 NB U; SG163 NB U; SG196 NB U; SG211 U; SG214 U; SG257 M/U; SG429 M; <strike>SG449 M; SG475 M; SG529 M.
[23Mar12] #1 on ebay starting at 99p [30Mar] Got it for £10.01. [30Mar12] #2 SG163 starting at 99p [6Apr12] got it for £5.61. [1Apr12] It must be time to start monitoring the embossed issues. The cut to shape stamps sold for a fraction of the cut square and I have no notion why the non-stampy bits of paper make so much difference, so I'll aim for a set of shapes. [11May12] # 3A pair of SG101s for £2.85. 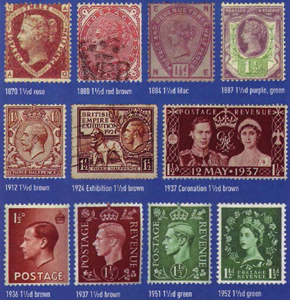 [22May12] #4 SG55 for £10 - embossed now complete. 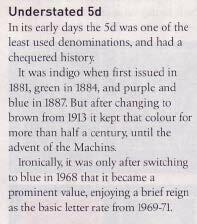 An examination of definitive colours and associated commemoratives would not be complete without the 1/3, 1/6 and 1/9 values (they sound to me like the prices of fish and chip suppers and cinema tickets - I was too young for beer then). Commems needed: SG534 M; SG559 M; SG569 M; SG620 M; SG630 M; SG633 M.
Commems needed: SG535 M; SG622 M; SG625A M; SG641 M.
I have only just realised [22Mar12] that there are any two-shilling stamps. I know I intended to stop at 1/-, but then overran with the others . 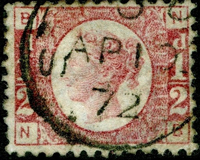 The 2/- are the right size. 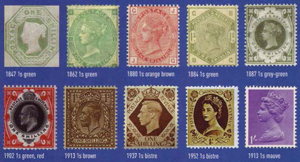 And I believe that's it: thereafter, 2/6 stamps were issued in larger format definitives. No NBs on ebay as at 22Mar. 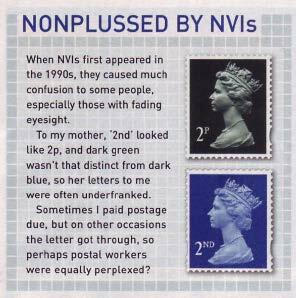 [11Apr12] You don't get many 2/- browns coming through ebay and no NBs yet. I kept an eye on #3, just to get an idea of prices. 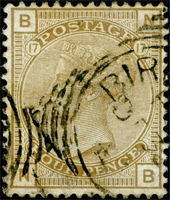 It sold with 34 bids from 19 bidders for £749.89, 23% of cat. [16Apr12] SG120, starting at a modest 99p. I tried but came second, it sold for £12.88. [30Mar12] #1 a lovely SG180 for £795. [4Apr12] #2 SG178 2/6, starting at 99p. 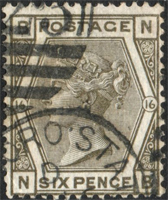 [20Apr12] #3 SG178 2/6, with a diagonal crease, starting at 99p. 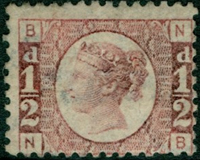 And #12 the first £1 NB, SG212, selling for £150: I am tempted. 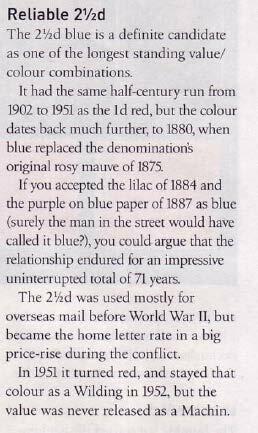 There are a few more notes in the original article which are included here for the sake of completeness. 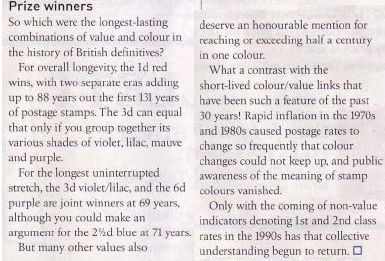 The pre decimal acquisition strategy is based on David Wright's article The colours that kept on running from the September 2009 issue of Stamp Magazine. 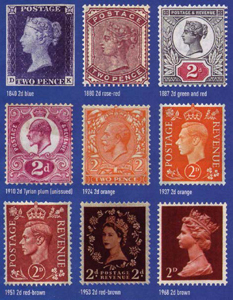 Prices and most of the data is from a 2007 edition of SG GB Concise with additional information [and prices in square brackets] from British Stamp Market Values 2012, available from Amazon. Regarding the symbols used next to the wanted lists, a tick (✓) means 'got one', an asterisk (*) means 'initials available' and two ticks (✓✓) mean 'got one with initials'. 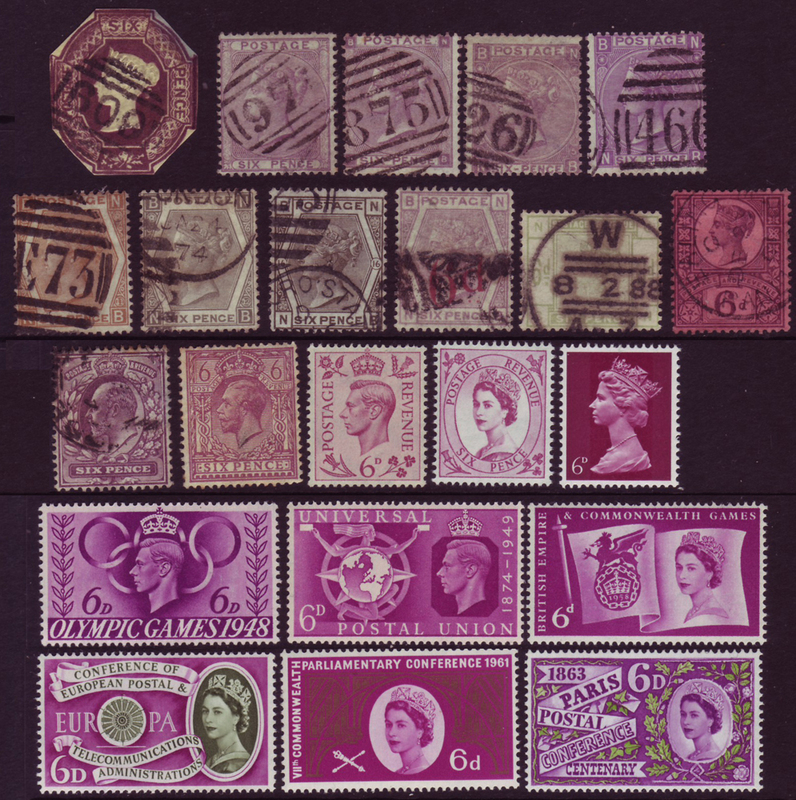 Of these, I am likely to seek: all the imperforates; all the 'two corner letters'; white lines (not distinguishing between thick and thin); one of each of the 'four corners', ignoring the colour and size thereof). [5Mar12] Initial research complete. Next build a wants list in a spreadsheet, prioritise and start looking. Here it is. [9Apr12] I have added the Smiths prices (see note 2) for the Victorians and they are significantly cheaper, but still much higher than ebay prices. 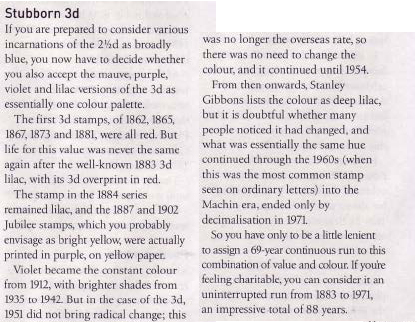 Perhaps the catalogue will be more useful as a simplification of variants rather than a price indicator - the approach is pleasingly similar to mine (see note 4).
. I will leave acquisitions and notable examples on the page. Up - top . .